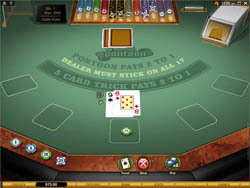 Pontoon is played with eight decks. Cards have the same value as in regular blackjack, but the terminology and basic rules are different. When the game starts, you are dealt 2 cards, and the dealer gets 2 face down. Dealer peeks for a winning hand, and if he has one, he wins. Otherwise gameplay goes to you. First of all, you have to hit when you are below 15, but hit is called ‘twist’ in Pontoon (and stand is called stick). If you twist, you get another card. Another option is to buy, in which case you also get another card but you double your bet. You can buy on any 2, 3, or 4 card, and only once per hand. You can twist and buy until you have up to 5 cards. The best hand is not a natural blackjack, but a Five Card Trick. To get this, you have to twist or buy more cards to end up with 5 cards, but with a point total of 21 or less. The next lowest hand is pontoon which is an ace and a 10-point card (basically, a blackjack), then a hand totaling 21 with 4 or less cards, then standard hands less than 21. You can split for another wager equal to your original, and you can re-split once. Split aces only get one card, and a 10-point card on top of an ace after splitting does count as pontoon in this game! Minimum bet is 1, and maximum bet is 200 (Euro/GBP/USD). Chips come in seven denominations for easy betting. A Pontoon or Five Card Trick pays out at 2:1, and a standard win pays out at 1:1. No insurance bets can be placed. Buying costs 1x your original bet, and splitting costs 1x your original bet. There is no need to worry about being distracted by silly, flashy graphics and animations when trying to learn or play Pontoon. Everything is subtle and done just right, from the animated card flips, to the chips which hover over the table slightly when you are choosing how much to bet. The view of the table is from an angle, and you can see all the action perfectly. Cards are large and easy to read. Background music and sounds are subtle, and add a nice atmosphere to the game. All in all, the visuals work very well, and once you get past the unusual rules, the game plays just fine, as the design is quite good. Pontoon (Gold) is a winner, but only if you’re in the mood for something unique. Once you get used to the game, it is quite a lot of fun, and many people come to prefer it over blackjack, since there is a way to win when you get a lot of low cards in a row! Even a hand with five 2’s beats a natural 21! Again, while Pontoon Gold is not for everyone, it is most definitely worth checking out, as you could learn to love it!